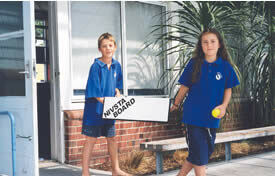 Nivsta Boards can be introduced at assembly. Ideally you would have one board for each class. 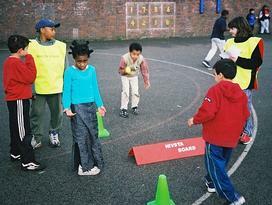 1) The teacher tells the children that whoever makes good choices gets to use the game at morning break. 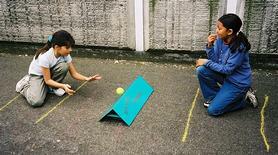 2) The teacher tells the children that whoever makes good choices gets to use the game at lunch break. Nivsta Board school programme. 3) The two children chosen go out to morning break first and are to go automatically to the front of the line when waiting to re-enter the classroom. 4) The same applies for lunch time lining up. 5) When using the Nivsta Board it is to be placed in a selected area of the playground, this area is not to be entered by any other children, in time others will want a turn and are likely to start asking questions on how to get a turn. 6) This is where your school is set. You have the options to: – move the board around to different classes. – have one board in each class. – have the option to make one day of the week a Nivsta Board open day where all boards are in the playground on the grass or concrete area. This is where the year 6 children are to be monitors wearing their bibs. Taking a list of all children wanting to have a turn. 7) Certificates are an option for the most earned turns for each child, class, for the week. Maybe the class with uniform worn the most days, or the highest register attendance for the week with least latenesses gets the Nivsta Board for the coming week! The game helps release pent up tension and energy for the children as it involves elements of Aussie Rules, Handball, Waterpolo, Cricket, Gridiron, Rugby, Basketball, Netball and Baseball. plus sponsor(s) writings too. The tennis balls will have NIV IT NOW on them. Please refer to the Skills and Values page at this website explaining the four sets of Rules and how skills are used in each set of Rules and Values used too.